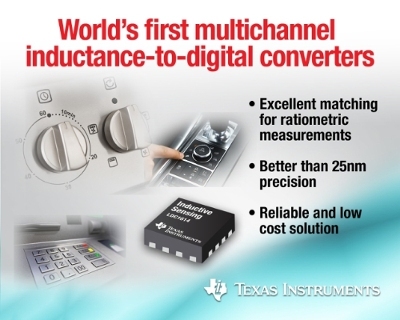 Texas Instruments (TI) (NASDAQ: TXN) today announced the world’s first multichannel inductance-to-digital converters (LDCs). The four new devices in the LDC1614 family expand the innovative LDC portfolio, a data converter category that TI first introduced in 2013. The devices offer two or four matched channels and up to 28-bit resolution in a single integrated circuit (IC). For information about the new LDCs and access to a full suite of design resources, visit ti.com/LDC-pr. The combination of precision and multichannel functionality will allow engineers to design high dynamic range position and motion sensing solutions with simpler system designs and reduced cost. Unlike other technologies, LDC-enabled inductive sensing employs low-cost, high-reliability inductors as sensors, which can be located remotely from the IC. By integrating up to four channels in a single IC, the LDC1614 family allows designers to distribute sensors throughout a system, while centralizing electronics on fewer printed circuit boards (PCBs). This can benefit precision linear or rotational sensing and metal detection in a variety of end equipment including white goods, printers, cameras and automotive infotainment consoles. Multiple, well-matched channels: Enables differential and ratiometric measurements, allowing designers to easily compensate for environmental and aging conditions such as temperature, humidity and mechanical drift. Precision measurement capability:With up to 28-bit resolution, the devices can detect submicron changes in distance. Wide sensor frequency range: By supporting a frequency range of 1 kHz to 10 MHz, designers have flexibility to use many types of inductors as sensors. This frequency range also enables use of very small PCB coils, which reduces overall sensing solution cost and size. Low system power:Powered by a 3.3-V supply, the LDC1614 family consumes approximately 6.9 mW during standard operation and 0.12 mW while in shutdown mode. High reliability:Offers contactless sensing that is immune to nonconductive contaminants, such as oil, dirt and dust, which can shorten equipment life. The LDC1614EVM, which includes the ultra-low power MSP430F5528 microcontroller (MCU), is available to evaluate the LDC1614 and can be purchased today in the TI store for US$29. System designers can build sensors in minutes with TI’s WEBENCH® Inductive Sensing Designer. This online tool simplifies sensor coil design based on application and system requirements. The optimized design can be easily exported to a variety of computer-aided design (CAD) programs to quickly incorporate the sensor coil into an overall system layout. The 16-button keypad reference design (TIDA-00509) uses the LDC1314 in a multiplexed inductive keypad system, which can be easily scaled to allow for up to 64 buttons. This reference design uses stainless steel, snap dome-based keys, a low-cost technology option for buttons. The contactless solution supports simultaneous button press and provides a more robust and reliable design compared to mechanical keypad solutions. Other inductive sensing reference designs are available by searching the TI Designs reference design library. Each device in the LDC1614 family measures 4 mm by 4 mm and is easily configured via its I2C interface. Pricing and packaging of each device is listed below. *Unit price listed is for quantities of 1,000. Download the data sheetfor the LDC1614. Learn more about inductive sensing atti.com/LDC-pr . Read design tips in theinductive sensing series on the Analog Wire blog. Search for answers and get help with your designs in theInductive Sensing Forum of the TI E2E™ Community. Explore TI’s large portfolio of innovative sensing solutions atti.com/sensing. Panasonic Launches Eluga L 4G In India: Goes Fast Lane With The Launch of 4G Device!